The 53rd National Conference of the National Association of Teachers of Singing begins officially on Saturday! In preparation for your trip to Boston, the NATS National Office has sent a series of e-mails and reminders to assist in your planning and travel. This is the final of those four messages, and we hope that the information contained here will be helpful. If you have other questions, please e-mail us at info@nats.org so that we can better assist you. If you missed the first three messages, you can find them here. 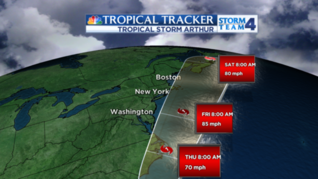 Preparations are being made for the arrival of the Hurricane Arthur in the region early Friday morning. The holiday weekend is not expected to be a complete loss for the estimated quarter-million visitors vacationing on the Outer Banks of North Carolina or farther north. Forecasters say the storm will move through quickly with the worst of the weather near Cape Hatteras, NC, about dawn Friday. Then it is expected to clear. The annual Boston Pops Fourth of July concert and fireworks show was moved up a day to Thursday, July 3, because of potential heavy rain ahead of Hurricane Arthur. Flights into Boston are not expected to be impacted by the storm. Many options exist for finding food in and around the Boston Copley Place Marriott. A grocery store – Shaw’s – is located directly across the street from the hotel entrance and offers a full variety of items if attendees wish to stock their rooms. Dining options at the hotel include Champions (American food), Connexion Lounge and Starbucks Coffee House. Two adjoining malls offer numerous food choices with quick-service and more formal dining options available. Click here to see more about the Prudential Center Mall. Click here to see more about the Simon Copley Place Mall. Food trucks are also very popular in Boston. Many options are located nearby. Click here for more information and a complete schedule of trucks in the area. This year’s event would not be possible without the many generous sponsors who have contributed and supported various components. Please click here to see this year’s list of sponsors and be sure to thank them for their participation. While more than 1,000 attendees are expected in Boston this coming week, many NATS members will be unable to make it to the 70th Anniversary celebration. As such, a complete coverage plan has been created to keep everyone close to the action. Below are details of what can be expected daily from the 53rd National Conference coverage page, which will go live on Friday, July 4, at nats.org. - Live Blog entries: NATS Marketing and Communications Administrator Tom Strother will keep a running record of the conference through his live blog each day. Be sure to log in and interact, ask questions, offer feedback, or just say a friendly hello. - Photo Galleries: Two photo galleries will be posted each day – one from the morning sessions and one from the afternoon sessions. These will captures attendees, sessions, and all of the exciting happenings at the 53rd National Conference. - Video Updates: Interviews with attendees, presenters, staff and honored guests will be posted throughout the conference to help capture to flavor and color of the event. Be sure to watch NATS.org and the organizational YouTube channel for all of the exciting content. - Important News & Notes: Throughout the conference, special news items and announcements will be posted to the conference coverage page. Many of you have already taken to Twitter and Facebook to share your thoughts on the trip to Boston. Thank you, and keep it coming! Be sure to post your photos and updates on Twitter, Facebook, Instagram, Pinterest, YouTube or whatever your social media platform of choice might be! We will share your messages via the Official NATS platforms as well. Use the hashtag #NATSinBoston with each post to properly brand your messaging. Make it fun and exciting. Tell us YOUR thoughts and show us what YOU see. We can’t wait to see what you have to say! And start from the minute you walk out the door – On my way to #NATSinBoston and @OfficialNATS conference! Friday, July 4 – 12-4 p.m.
Saturday, July 5 – 8 a.m.-5 p.m.
Sunday, July 6 - 8 a.m.-5 p.m.
Monday, July 7 – 8:30 a.m.-4:30 p.m.
Tuesday, July 8 – 8:30 a.m.-3:30 p.m. On-Site Registration: If you are planning to register on site, please note that the online portal will reopen on June 30 to make this process easier for you. Simply visit the registration page at NATS.org/Boston2014. You can complete your registration form online and make payment by credit card from the comfort of your room or home and have your materials waiting for you when arrive at the registration desk. Our online portal accepts MasterCard and Visa only. If you prefer to pay with Discover or American Express, you can do so at the registration table, in addition to payment by check, purchase order, or cash. Parking is available near the Boston Marriott Copley Place, either through the hotel, in the nearby self-parking lots, or at the Metro Boston Transportation Authority commuter parking lots in outlying areas. For those attendees arriving by air, multiple options exist. NATS has negotiated a discounted shuttle rate from Boston Logan Airport. For more information about parking and transportation, visit the NATS.org/Boston2014 click the Boston Conference transportation page. Free internet access is available to conference attendees in all lobby areas of the hotel, in addition to the guest rooms for attendees staying at the Boston Marriott Copley Place. Paid internet access is available inside the conference rooms for attendees desiring to stay connected through Wi-Fi during the sessions. See the registration desk for more details. UPDATE: For accessing wireless internet in your room, attendees staying at the Boston Marriott Copley Place should just register for it as if paying for the service. The charge will be automatically removed from your bill at check-out. Additional devices can also be registered in the room.